Standing desk converters are devices that rest on top of your desk and raise up and down so you can stand and work. Over the last few years, these desk conversion tools have become enormously popular ways to make your workspace more active. Every time you turn your head, a new standing desk converter pops up on Amazon. They’ve taken the office fitness world by storm, and the storm show no signs of abating. Given the abundance of options, it’s increasingly easy to get stuck with a unit that’s suboptimal for your needs. More variation means more complexity. To make matters worse, the information available on these products is often coded in technical jargon, creating a swamp the uninitiated consumer must wade through. Dual ergonomics, tilting keyboard trays, VESA mounts—these terms are important for finding a healthy standing desk converter, and we describe them to you fully in our detailed reviews. So which model is best for you? This comparison review is here to help you do your research. We’ve reviewed these products extensively over the last three years. Here we segment them into categories based on their architectural design, and rate them based on performance and value. It’s your comprehensive guide to the world of standing desk converters. 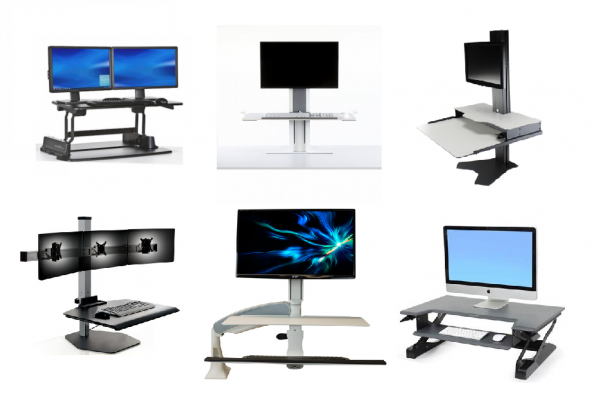 Now you’ve seen each type of standing desk converter, it’s time to narrow down to the models themselves. Take a look at our review summaries below for more details on each product. Z-Lifts: Grab the main work surface on either side, squeeze the brake release paddles, lift the platform up, then let go. Zip. 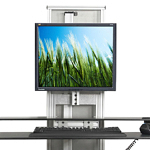 Z-Lifts are the most popular type of standing desk converter, and include the infamous Varidesk along with the ZipLift+. They offer some of the best work surface stability while standing, serious ease of use lifting up and down, and generally a low to middle-of-the-road price tag. Named after their Z-shaped architecture. Learn more. Summary: The newest competitor attempting to dethrone the Varidesk, the ZipLift+ introduces an ergonomically-adjustable keyboard tray, a silky-smooth and quiet Z-lift mechanism with infinite stops, a grommet hole for mounting an ergonomic monitor arm, and granite-hard stability even at full 20″+ height extension. For the same money as a Varidesk Pro, it overcomes all the deficiencies of its highly popular, yet outdated competitor’s design. The icing on the cake is the free EverMat™ Portable Standing Mat that comes with every purchase. Read our full review. Summary: iMovR’s newest stand up desk converter is a continuation of their popular ZipLift series. A 42″ heavy duty model supports weight of 45 lbs and features a 20″ height range that can accommodate users from 5′ to 6’7″. What makes this desk riser truly stand out in a sea of competitors is the adjustable ergonomic keyboard tray and grommet holes for monitor arm alternatives. Summary: The ZipLift Patriot is an update on the 35″ ZipLift+, featuring 3D-laminated surfaces with better durability and aesthetics. It’s everything we loved about the original ZipLift in a classy new finish. Plus, the Patriot is made in America which opens it for GSA compliance. Important features it retains are a tilting keyboard tray, a pneumatic lift system with infinite stops, and an extra-sturdy work surface. Summary: Unlike the similarly-designed VariDesk Pro Plus, the Workfit-T offers superior neck and wrist ergonomics with its optional monitor kit. Install is simple, no tools required. Its lever-locking adjustment mechanism doesn’t allow for precise adjusting, and there’s not space aplenty for your keyboard and mouse. But its impressive stability makes it a sound choice for sit-stand workers. Read our full review. Summary: The price tag alone was enough for this minimalist desk riser set to catch our attention – only DIY desks can compete with the WorkEZ in terms of thrift. WorkEZ desks can be frustratingly shaky, and don’t adjust as quickly as we’d like, but those gripes seem relatively minor given these risers’ tiny price point and ergonomic benefits. They also travel better than any other riser, thanks to lightweight construction and complete collapsibility. Read our full review. Summary: Purpose-built for taller users, the Exec 40 and 48 have the largest height adjustment range of any desktop converter in Varidesk’s catalog (18″), finally surmounting the low height maximums typical of Varidesk. Despite its enhanced height range and expansive work surface, the Exec series is still burdened by Varidesk’s classic adjustment mechanism, which lacks the precision (only nine height settings), smoothness, and quietness of more advanced workstations. A $125 monitor arm add-on is necessary for proper ergonomics. Read our full review. Summary: VariDesk’s first standing desk converter model, the VariDesk Pro, is also the most basic, most affordable standing desk converter in VariDesk’s catalog. Once among the best choices for transforming a fixed-height desk into a sit stand workstation, the VariDesk Pro has since been outdone by newer workstations with a host of new, innovative ergonomic features. Read our full review. Summary: Varidesk’s original Pro standing desk converter is getting an ergonomic makeover with the introduction of a separate, suspended keyboard platform. 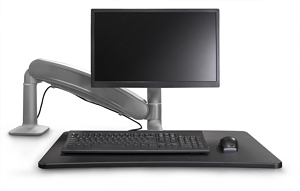 This new “Pro Plus” model enhances the ordinary Varidesk with more acceptable ergonomics, while an optional monitor arm provides more ergonomic viewing angles than the Varidesks of old. 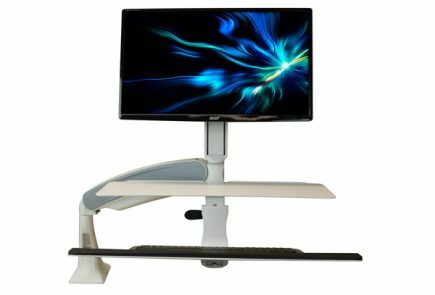 These much-needed updates keep the Varidesk Pro Plus competitive in an evolving standing desk converter market, but still fall short against more advanced height adjustment mechanisms of other ergonomic risers. Read our full review. Summary: The Varidesk Cube Corner is purpose-built to fit inside the confines of a small corner desk. Its triangular work surface fits snugly into any cubicle corner while still providing plenty of user space, and its suspended keyboard tray extends the distance between your monitors and keyboard, creating a more ergonomic setup than the original Varidesk. But the Cube Corner still suffers from some Varidesk-specific shortcomings, most-important of which is its antiquated height adjustment mechanism. There are now also new options available for full standing corner desks that can fit into most any cubicle, worth considering. Read our full review of the VariDesk Cube. Summary: The Vivo Standing Desk Converter is a budget option that cuts corners on key components—despite its appealing pricetag, it isn’t for everyone. Changing the converter between sitting and standing positions is exceptionally difficult, especially for shorter users who will have trouble getting leverage. The handles exhibit some strange behavior, and the pen tray in the center of the work surface leaves us even more baffled. Plus, a non-tilting keyboard tray is not ideal for ergonomics. Is a budget converter better than no converter at all? Read our full review here. For more details about Z-Lifts, see our comprehensive review Best Stand Up Desk Converters in Z-Lift Category. X-Lifts: X-Lifts are cousins to the Z-Lifts. One advantage they have is lifting straight up and down, instead of arcing out into your cubicle space. This gives them a tad more inherent stability and means they save space. On the downside, their X-shape introduces ‘pinch points’ into the frame, meaning you’ll have to watch your fingers while lifting. They tend to be a tad less expensive than Z-Lifts. Learn more. Summary: The FlexiSpot Classic Standing Desk Converters offer spacious work surfaces, sturdy frames, and extraordinary low prices in a variety of size options. A fleet of standing desk converters that beat each corresponding Varidesk size on all accounts. Straight up-and-down lift, removable and retractable keyboard tray (no tilting though), and all models fit comfortably on narrow 24″ deep desks. Read the full review. Summary: Ergotron’s new Workfit TX model brings several new features to the table, notably a dropped keyboard tray that sits below your desk height at sitting position (which itself tilts ergonomically—something we’ve wanted to see for a while). But it’s the fundamentals where the TX truly shines, with outstanding stability even at max height, an infinitely adjustable lift mechanism, and an impressively sized work surface. It even fits on a 24″ desk despite its deceptively large appearance. The only drawback is that you’ll have to use Ergotron’s proprietary monitor arms to work with the low-resting work surface. Read our full review. Summary: The Cooper by Fully is an above-average standing desk converter with an available bamboo top that’s sure to turn heads. A noisy lift, non-tilting keyboard tray, and a few other design choices keep this product from being a home run, but it’s still far ahead of most of the competition. As long as you’re not lured in by the promise of an “eco-friendly” product, the Cooper is a solid choice. Read the full review. Summary: Halter’s ED-258 brings an extra-deep keyboard tray to the table, one that comfortably fits even larger laptops. However, this budget standing desk converter has the lowest quality handles we’ve ever seen, plus a dangerously weak lift system that buckles under heavy loads. Stay away unless you really crave the deeper tray and woodgrain HPL finish. Read the full review. Summary: With the smallest footprint of any Varidesk desktop converter, the Laptop 30 is the most compact workstation in Varidesk’s catalog. Its height adjustment mechanism looks identical to the easy-to-use lever locking system of the original Varidesk, but unlike other Varidesk models, its vertical adjustment doesn’t force the work surface to arc out towards you. However, the Varidesk Laptop 30 still leaves much to be desired when it comes to work surface space, weight capacity, and ergonomics. Read our full review. Summary: Lacking a keyboard tray and the capacity for monitor arms, the X-Elite Pro is a simplistic alternative to more advanced designs like the Varidesk and Ziplift+. It’s lightweight and relatively portable, with a clean and unobtrusive design that makes it popular with the home market. However, the the lack of a keyboard tray makes typing somewhat of an ergonomic nightmare. Plus, at any height in between the maximum and minimum settings, the work surface is springy and unstable. For more details, read our full review. For more details about X-Lifts, see our comprehensive review Best Standing Desk Converters in X-Lift Category. 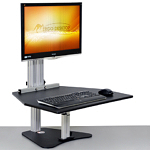 Post & Base: These units sport a sturdy post that holds a keyboard platform and a monitor. Like Z-Lifts and X-Lifts, they typically sit freestanding on your desk – no need for cumbersome desk clamps. They take up less space on your desk than Z-Lifts or X-Lifts, and many also offer impressive built-in monitor adjustability for positioning your monitor(s) at ideal heights and angles. Learn more. Summary: The Winston’s biggest advantage is its locking air cylinder, which prevents the work surface from moving out of place and lets you switch from sitting to standing with a hand lever embedded in the underside of the work surface. This quick adjustment method, coupled with an impressive weight capacity and the ability to hold as many as four monitors, gives it an edge in usability. One sour note is its lack of an independently adjustable monitor-height setting, which prevents the Winston from being a perfect ergonomic workstation. Read our full review. Summary: Attractive, simple, user friendly. The WorkFit-S has the sleek, efficient design we love in Ergotron products. Setup is incredibly easy, as the clamp attaches to the front of an existing desk. No cranks or motors; instead the unit moves with the signature Ergotron glide. This model may lack the flexibility of other sit-stand options (and its keyboard tray is a little flimsy), but it makes up with superb stability and ease-of-use. Plus Ergotron stands behind their products; customers can expect a rock-solid 5-year warranty and outstanding support. Read our full review. Summary: The Wallaby is Ergo Desktop’s budget-class alternative to their successful Kangaroo sit stand workstation. It’s based on the same design, sporting the same free-standing steel base, impressive weight capacity, and peerless stability, but without the gas-assisted monitor lift mechanism that made the Kangaroo such an ergonomic hit. Despite this, the Wallaby still features a robust set of capabilities that make it a great value for any office. Read our full review. Summary: From its $549 price tag to its freestanding, heavy-duty design, the Hover Helium clearly takes aim against the original post-and-base standing desk converter, the Kangaroo. It has many of the Kangaroo’s beloved features—simple, clamp-free installation; an expansive work surface; and a smooth, silent gas-assisted lift mechanism. But the Helium goes a step further by introducing a locking air cylinder attached to a Bowen cable to create a seamless adjustment method you can operate with one hand. Like the Kangaroo, and unlike some of the lower-quality entrants in desktop converter category, the Helium is a made in America. It’s ergonomic downfall, however, is a monitor height adjustment mechanism that is so cumbersome and frustrating as to leave most users either reluctant to stand or settling for the neck strain of having their monitor at the wrong height half the time. Exposed screw heads and fingerprint-prone paint finish are part of it’s garage shop aesthetic that is obvious when viewed side-by-side against the Winston. Read our full review. Summary: The Kangaroo sit stand workstation is one of the few models with independent monitor and keyboard platform adjustment, making it one of the most ergonomic standing desk converters around. It can’t be beat for convenience with a wide range of style and pricing options. It features a variety of optional upgrades, and comes with a removable stabilizing leg (a little cumbersome). But with the help of the leg, it becomes the most stable workstation we’ve ever reviewed. We fully recommend going down under if you’re after a sit stand workstation. Read our full review. Summary: Sleek, modern aesthetic – clearly the ‘looker’ in the bunch. The QuickStand oozes with Humanscale’s trademark modern design aesthetic, making it the best choice for office environments that covet high architectural design. As you would expect at this end of the price range the monitor and keyboard heights are independently adjustable. A couple of minor design tweaks would earn this product a 5-star rating from our desk riser expert review team, but we can wholeheartedly recommend it for those users who are willing to pay a little more for a clean, modern look that won’t clash with the elegance of their desk or office. Read our full review. Summary: The latest addition to Humanscale’s QuickStand series of converters, the Eco is yet another example of great-looking design meets ergonomic insufficiency. The tray is too wobbly to type comfortably on, and the monitors are not independently adjustable relative to the work surface (without a great deal of hassle). It may work as a laptop stand for short work sessions, but in general this product is a lot nicer to look at than it is to use. Read our full review. Summary: A decent standing desk converter when evaluated on its own, but severely under-featured and overpriced when compared to other items in the category. Its lever locking-height adjustment is loud and doesn’t offer as many height settings as a gas-assisted riser, so it’s more difficult to find an ergonomically proper height. No true secondary adjustment for monitor height, or at least no easy adjustment. A “v-shaped” base allows the central column to rock much more than we’d like. Clamps to the front of the desk, reducing the amount of accessible space on your desk top. Read our full review. 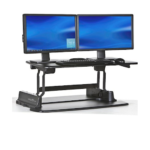 For more details about Post & Base models, see our comprehensive review Best Standing Desk Converters in Post & Base Category. 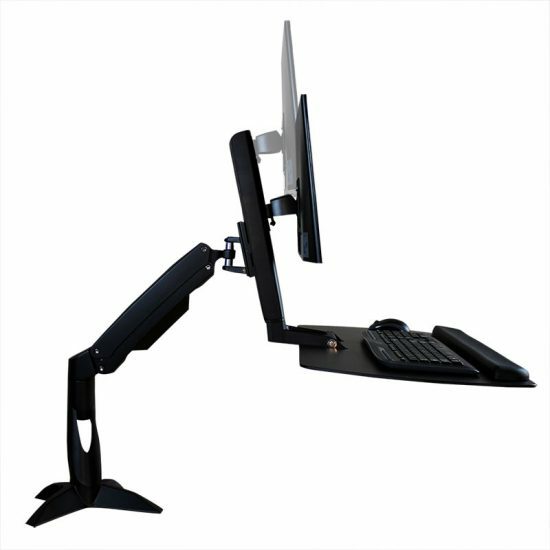 Hovers: Hovers are essentially oversized monitor arms with work surfaces. They “hover” over your desk, swinging across a large 3-dimensional area. Their design saves more desk space than any other type. Work surface stability is not their strong suit, but these units offer the best ergonomic adjustability and fine-tuning available, and they make screen-sharing and collaboration easy. Learn more. Summary: iMovR’s first entry into the standing desk converter category literally rises above sitting disease. The Cadence Pro workstation’s space-preserving “hover” design retains virtually all of your desktop real estate and maximizes mobility and collaboration. 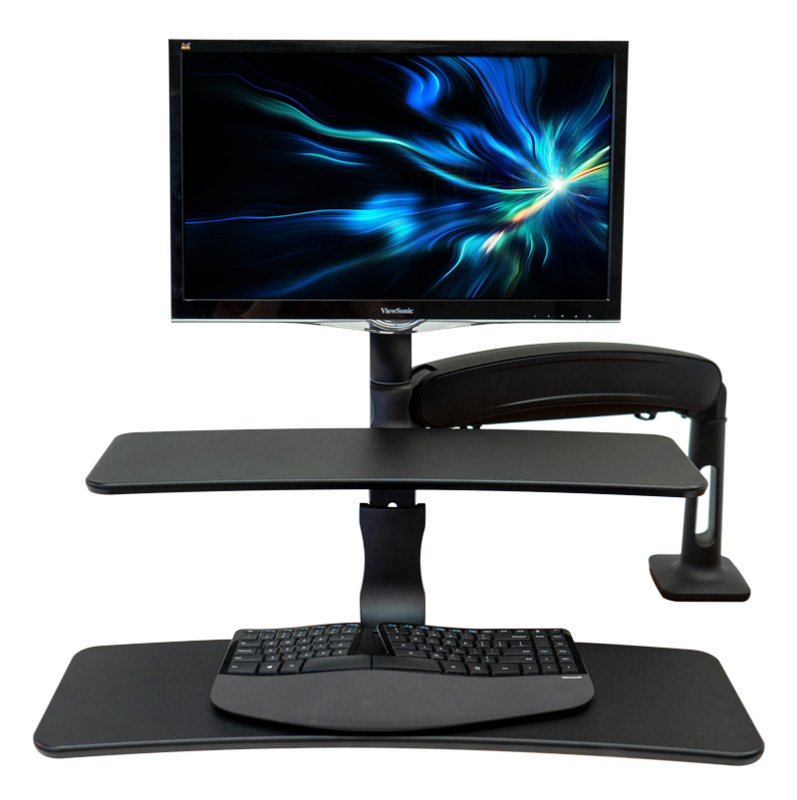 It also brings more ergonomic adjustments to the table than any other standing desk converter we’ve ever reviewed—with the ability to move throughout an astounding 105”-diameter area—providing a more comfortable and productive experience for all users, sitting or standing. With all of its ergonomic improvements and elegant styling, the Cadence gives the venerable, but aging progenitor of hovering sit stand workstations—the Ergotron Workfit-A—a run for its money. Read our full review. Summary: With a design that “hovers” over your desk, the Cadence Plus allows you to keep virtually all of your desktop real estate as accessible as ever, and allows you to swing your keyboard and monitors completely out of the way, or easily share with collaborators. Its lightweight MDF core worksurfaces make spatial adjustments easy and offer a sleek matte-black look. While ‘hover’ style desk converters are inherently less stable than Z-Lifts like the ZipLift or Flexispot workstations, the Cadence Plus’s unique design more than makes up for its shortcomings, and is ideal for collaborative, and paper flow-intensive workspaces. Read our full review. Summary: If you’re looking for great adjustability and an aesthetically pleasing design, the Cadence Express does it all for a very competitive price. With a five-year warranty and high-quality components, it is built to last, unlike many of the products in this price range. While it doesn’t have the fancy independent keyboard tray and friction slide monitor mount of the original Cadence, the slightly smaller size of the Cadence Express is likely to appeal to a greater number of users, and the price definitely will. Read our full review. Summary: This compact version of Right Angle’s Helium model looks nothing like its namesake. Its small dimensions fit extraordinarily well in tighter work spaces, and its Hover design up minimal space on your desk. Relatively light weight for easy installation. Sturdy construction, and decent (though not best in class) stability for a Hover model. Five-year warranty. Read our full review. Summary: Among Ergotron’s standing desk converters, the Workfit-A is the acrobat. It’s easy to move from sitting to standing and side to side. The only footprint is the small base mounted to your desk, and it can be lifted out of the way when you need more desk space. It does suffer more from monitor shake than either the Workfit-S or -T, and its lift capacity is weak compared to more “grounded” risers. The Workfit-A was once a pioneering product, but it’s now being overshadowed by more innovative, ergonomically adjustable units. Read our full review. For more details about Hovers, see our comprehensive review Best Stand Desk Risers in Hover Category. Electrics: This is the Cadillac Showroom. Electrics owe a structural debt to the “Post & Base” category, but they add an electric lift mechanism for an effortless transition between sitting and standing. Press a button and you’re working at standing height. Their programmable height presets (like full standing desks) allow you choose your precise standing height and automatically move to it every time you stand. Overall, a classy option for those with the budget. Learn more. Summary: Upgrade the strong and stalwart Kangaroo Standing Desk Converter to Electric, and you’ve hopped your way up to most sturdy electric riser on the market. It boasts a heavy-duty motor with 150 lbs. lift capacity, and features the same wide range of adjustability signature of the Kangaroo line. It may not be the prettiest with its ‘form follows function’ design philosophy, but its stabilization leg prevents shaking. The Kangaroo remains the sturdiest electric we’ve tested. Read our full review. Summary: Stable, quiet, and well-designed, the Varidesk Pro Plus 36 Electric is one of our favorite selections from Varidesk’s catalog of products. It’s the best electric riser under $500, and while it may not have as much ergonomic adaptability as pricier models, it doesn’t disappoint in terms of overall quality. Plus, it includes the Varidesk PowerHub for free, which helps with cable management and device charging. Read our full review. Summary: Ergotech’s new desktop riser, the One-Touch Free Stand, represents a step in the right direction for electric-powered risers. Its main competitor, the tankish Taskmate Executive, seems like an anachronistic behemoth next to this comparably sleek and customizable new riser. The monitors may be somewhat difficult to tilt/pan/rotate, and installation is a bit complicated, but it boasts tons of customization options and can accommodate up to four monitors. It has a massive 100lbs weight capacity, and its easy one-touch electric height adjustment is quiet and smooth. Read our full review. Summary: Available in a variety of sizes and colors, the Versadesk is an electric standing desk converter that boasts an impressive 80 lb lift capacity. Its marketing promises to save you from a “sitty life.” An unsteady keyboard tray, noisy lift, and internal design flaws keep it from being all that it claims to be. Users looking for a standing desk converter on a budget should stick to manual for better quality and ergonomics. Read our full review. For more details about Electrics, see our comprehensive review Best Stand Desk Converters in Electric Category. These devices sit on your desk and raise your workspace, but only one level. Without the ability to change monitor height or keyboard tray height, these converters offer no ergonomic adjustability. Suboptimal for day-to-day standing, they might work in a pinch if you want a short break from sitting. They are lightweight and generally inexpensive. We have to start off this comparison review with an obligatory word of praise, plus a healthy dose of caution regarding the one brand of standing desk converters that is 99 times more likely to be known than any other, Varidesk. Thanks to this spinout division of costume industry giant Gemmy, and the millions of dollars they have lavished on television, radio, online, magazine and newspaper advertising over the past few years, hundreds of thousands of people search the web every month for deals and reviews on Varidesk products. 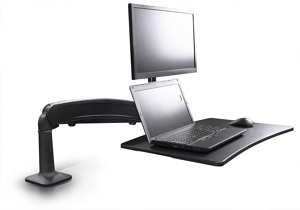 In fact, WorkWhileWalking is proud to have been the first site to review the original Varidesk back in 2013. All Varidesk models move out towards the user in an arced movement (an inherent mechanical attribute), introducing instability and pushing you away from your desk. Since then they’ve added several models (and we’ve added follow on reviews for each), such as the Varidesk Laptop 30, Varidesk Pro, Varidesk Pro Plus, Varidesk Cube, Varidesk Exec 48 standing desk converters, and the platypus of the pack, the Varidesk Pro Desk. Back then, before competitors arrived, we gave the first model – a most novel invention at the time – a 5-star review. But check out our reviews today, and you’ll find many competing models offer far better ergonomics and consumer value, while Varidesk has mostly stuck to its original, dated mechanical structure. While it is unquestionable that Varidesk helped raise the tide of sitting disease awareness and floated all boats, to the benefit of now a couple of dozen competitors, most Varidesk owners we hear from abandoned them within six to twelve months of purchase. While they appear very cost effective, these Chinese-made products tend to be overhyped with glitzy advertising claims, yet ergonomically deficient. Hence not only the rampant number of new competitors continuing to appear on the market every month but the ballooning number of online searches for “varidesk alternative” into Google. A key benefit to sit-stand converters is that they let you keep your old desk drawers, and eliminate the hassle of having to move out your old desk. There is also the perception that standing desk converters are less expensive than adjustable-height desks. It should be noted, however, that this price difference keeps getting smaller, especially when comparing the top-rated standing desk converters to any of the newest and greatest, low-cost, adjustable-height desks that have hit the market in the past couple of years. 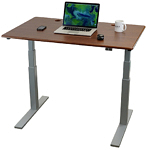 Some of the less expensive, yet high quality standing desks – such as the Upsilon, Ellure or UpTown – actually cost less than some of the fancier sit-stand converters – such as the Humanscale QuickStand, Winston or Electric Kangaroo. On the plus side, standing desk converters tend to be quicker and easier to install, lighter, and, often cheaper, than full-grown adjustable-height tables. There is a trade-off in stability and surface area – you’ll find that just about all of these products will jiggle a little during use, and it’s harder to set up a full workstation without the sweeping expanse of space you can get with an adjustable-height desk. Still, there’s no denying that a lot of standers will find these converters to be an extremely convenient and cost-effective alternative to changing out their beloved sitting desks. The most obvious case where a sit-stand converter will always work better than a standalone desk is when you’re contending with a built-in desk, where the expense of ripping out the furniture will clearly be out of the question. As for losing your desk drawers when switching to a sit-stand workstation, a lot of people just use mobile file pedestals to vanquish that particular problem. Solid ones can even do double duty as an extra seat for your office visitors. The best standing desk converters feature easy ways to adjust your monitor height – for optimizing ergonomics. If a stand up desk isn’t right for you, and you want the health benefits of standing and working, a standing desk converter can be an excellent solution. But keep in mind not every standing desk converter is created equal. Take away an ergonomic feature – like VESA mounts, adjustable work surfaces, or tilting/adjusting monitors, and your ergonomics could be compromised. Each of our product reviews features an ergonomic assessment, ranking the product in relation to its competition, so you can be sure of its long-term health benefits. A lot of what determines a product’s ergonomic soundness has to do with our individual anthropometries (fancy word for study of body measurements). Some standing desk converter manufacturers, perhaps in the efforts to cut costs, continue to ignore this, and end up producing products that cause as many ergonomic problems as they purportedly solve. For even more tips when buying a standing desk converter, check out our article Top 8 Factors to Consider When Buying a Standing Desk Converter. To stay abreast of all our newest reviews please subscribe to our FREE Newsletter.